In the summer of 1966, Rinker and Kernahan Buck - 2 teenaged schoolboys from New Jersey - bought a dilapidated Piper Club airplane for $300, rebuild it, and piloted it on a record-breaking flight across America - navigating all the way to California without a radio because they couldn't afford one. Their trip retraced a mythical route flown by their father, Tom Buck, a brash, colorful ex-barnstormer who had lost a leg in a tragic plane crash before his sons were born - but who so loved the adventure of flight that he taught his boys to fly before they could drive.The journey west, and the preparations for it, become a figurative and literal process of discovery as the young men battle thunderstorms and wracking turbulence, encounter Arkansas rednecks, Texas cowboys, and the languid, romantic culture of small-town cafés, cheap motels, and dusty landing strips of pre-Vietnam America. 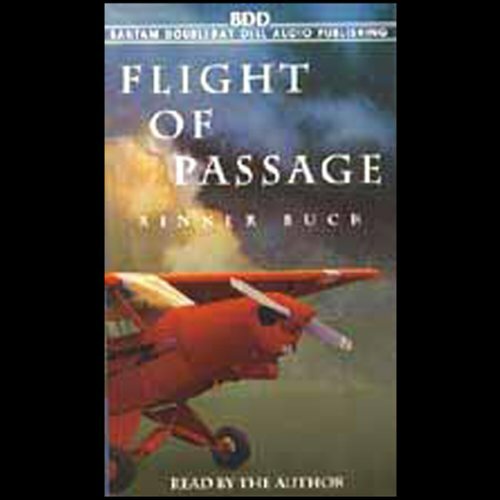 The brothers have a lot to resolve among themselves too - as Kern, the shy, meticulous, dedicated dreamer, and Rinker, the rebellious second son, must finally come to understand and depend on each other in the complex way that only brothers can.Most of all, Flight of Passages is a timeless story of fathers and sons. These 2 young men must separate from their difficult, quirky father - literally by putting a country's distance between them - but they do it on their father's terms: in an airplane. As he looks back, from the perspective of now being a father himself, Rinker Buck's tale of 2 young men in search of themselves and their country becomes a story about the eternal enigma of family - of the distance and closeness of generations, of peace lost so that understanding can be gained - and it is explored with a storytelling power that is both brave and rare.